Do you have so many CDs that you don't know what to do? Sometimes it seems that every Internet service provider sends me a new CD a week! Until now I have tossed them out, but I was recently inspired by the wonderful people on my favorite rubber stamping bulletin board (Gingerwood) to create unique pins with them! Below are just a few of the samples I created (after a few trials and errors!). Along the way, I discovered some tips that you might want to keep in mind. Note: The instructions below are for these pinsdon't let them hold you back from discovering your own technique for making fabulous CD pins! What kind of CDs can I use? I discovered that you can use only commercially created CDsthat is, do not use Read/Write CDs (the backing peels off when you cut them). How do I cut the CD? You can use any scissors you use for regular household purposes (don't use your good paper or fabric scissors!). I use inexpensive Japanese bonsai scissors. How can I prevent the CD plastic from cracking? When you hold your scissors, keep the blades at about a 45-degree angle (at least that works for me). An alternate way is to slightly heat the CD with your heat tool and cut. How do I make holes so I can add beads and charms? Use a drill with a small bit. Add holes after your pin is finished. Holding your scissor blades at a 45-degree angle, carefully cut the CD in half. Cut out your pin shape slowly, keeping the scissors at a 45-degree angle. Don't try anything fancyan amoebic blob is the best general shape. If you want to color the shape, do so now. You will be working on the shiny side of the CD. A blend of several colors looks really lovely. Coat the shape with clear embossing pad (make sure you coat the entire surface). Coat the shape with UTEE. Note: I dump my UTEE into a bowl and dip my shape into the bowl. Heat well with heat tool. Immediately dip the shape into the UTEE again (do not use the embossing pad again!). Repeat steps 5 and 6 until you have at least four coats of UTEE on your shape. Note: For pin 1 I added holographic powder and blue/green Pearl-Ex after the second application of UTEE. This gives a nice depth to the piece. After the final coat of UTEE is heated, immediately stamp into it with your stamp. Allow the piece to cool completely before removing the stamp. At this point, you can embellish as you please. 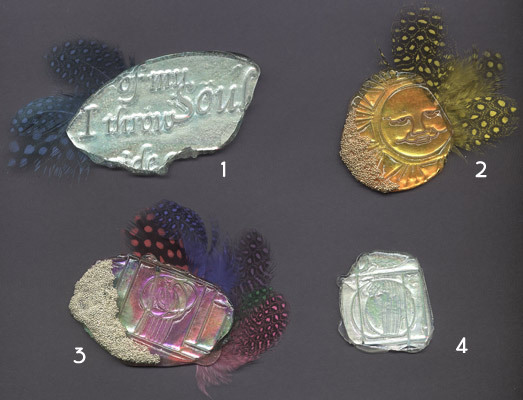 For example, for pins 2 and 3, I adhered gold or silver Beedz with clear Crystal Lacquer, and for pins 1, 2, and 3, I adhered colorful feathers to the back with Yes! glue. Be creative! Note: Before you add feathers or other "external" embellishments, coat your pin with acrylic spray to protect it. Allow to dry completely. Cut a piece of card stock or cardboard slightly smaller than the pin and adhere it to the back. Allow to dry. Sign your masterpiece on the back! Et voila! A work of art!